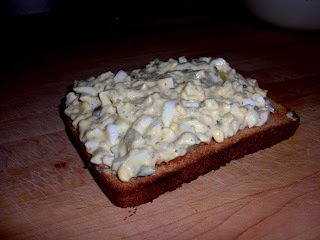 JC's favorite sandwich is home made egg salad. 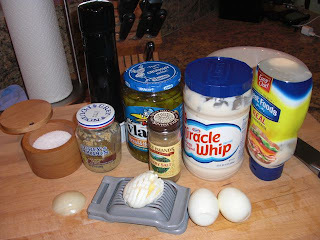 eggs, Miracle Whip, mayo, chopped bread and butter pickles, finely diced onion, mustard, celery salt, salt and pepper. 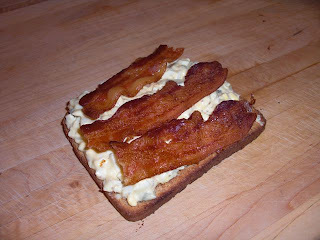 Yummier with bacon on top! The finished product - not the healthiest, but we did have cantaloupe for a side dish! THAT LOOKS SO GOOD! 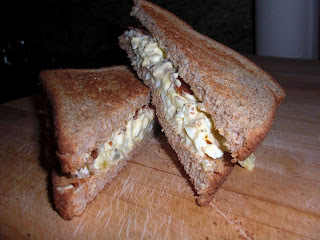 I will have to try that sandwich one day when my eggs are close to their due date. You made it semi-healthy by using miracle whip and whole wheat toast. YUMMY! It taste so good and I'm glad to know that it is healthy. I thought he had his fill of sandwiches in Denmark? Didn't yall call it the national dish? Ha! I remember he got a bagel egg sandwich one day, but of course, moms wil always be better. Yum-O! The Best Carrot Cake - Evah!! !